Earlier this year, Kuwait’s constitutional court issued a landmark ruling in favor of an expat female teacher’s case against the Ministry of Education. In April 2011, the Ministry excluded female teachers from an increase in the monthly housing benefit provided to its expat employees, which rose from KWD 60 to 150 for males. The existing contracts already excluded female expat teachers from receiving housing benefits if their husbands are teachers in the public sector. One Arab teacher’s decision to demand equal housing benefits reached the higher court, which ruled that she should be compensated for five years of unequal housing stipends, amounting to at least KWD 6000, and awarded future housing benefits. The ruling should have been a win for all female expat teachers working in the public sector, as local law mandate that the Ministry compensates all workers who could be affected by the court’s decision. Shortly after the ruling, Kuwait’s cabinet and the ministry of finance approved the decision, instructing the Ministry of Education to compensate all female expat teachers for unpaid housing benefits, starting from April 2011. The case, however, took an unexpected turn in the past few months. The education ministry said they could not afford the estimated 47 million sum for teachers affected by the ruling. The Minister of Education, Badir al-Essa, said the ministry’s request for extra funds from the Ministry of Finance to pay the teachers was denied, due to “budget failure.” As a result, the minister stated that only the woman who had won the court case would be compensated, and that the rest of female expat teachers will have to be dealt with “on individual basis,” - meaning, each teacher would need to pursue her own case. Following the court order, media and online social networks mobilized to justify the ministry’s decision. A group of citizen female teachers held a “protest” inside the ministry, questioning the “privileging” of their expat co-workers. Their claims hold little weight, as Kuwaiti citizens enjoy higher wages, constant pay raise, and housing benefits that translate into monthly payments or actual housing, as each family received a land plot and an interest-free housing loan. Widowed and divorced citizen women are also granted subsidized housing. Yet, citizens continued their usual attacks against Kuwait’s migrant population on social media, by demeaning the quality of their labor and vilifying them as “greedy.” Many also claimed that expat teachers profit from private tutoring, an illegal practice that has resulted in deportations of expat teachers over the past year. Kuwaiti media further sensationalized these arguments, tabling the issue on talk shows, and approaching parliament members for commentary. Moreover, the Ministry of Education will now reduce housing benefits to KWD 60. The decision, issued by the Civil Service Commission "in accordance to austerity measures," discounts the fact that Kuwait’s real estate prices are constantly rising, leaving migrants to live in small, over crammed, and distant accommodation, in order to be able to afford housing. With the recent 83% hike in gas prices, even remote housing is no longer affordable. Expatriates, even those working in the public sector, rarely enjoy wage increases and other benefits regularly granted to citizens to adjust of rising living costs. Rather, their living are sacrificed to offset the costs of cushioning the impact of the oil glut. Kuwait’s public education sector has at least 20,000 expat teachers, with estimated salaries between KWD 420-460 a month, plus housing benefit. If an expat teacher lives with their family, they pay around KWD 300-400 in rent, which amounts to at least two thirds of their wage. Teachers speaking to local press said they might have to live without their families in order to afford living costs, as their housing benefits get reduced. The Egyptian consulate in Kuwait has already expressed its concern at the latest contractual violation, after receiving a high number of complaints from Egyptian teachers over the past few days. Egyptians teachers represent the largest contingent of Kuwait’s education sector, and are also the second biggest expat community in the country after Indians. 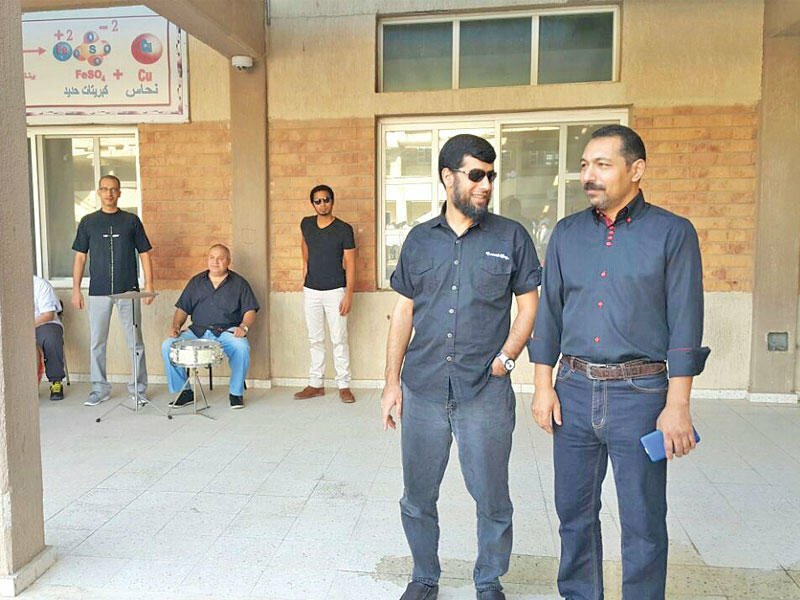 This week, expat teachers dressed in black to express their objection to the new decision, in response to a mobilizing call that circulated on social media. Egyptian teachers, as well as their Tunisian and Jordanians co-workers, said they will be planning a strike if the new decision is not overturned. Some unnamed officials at the Ministry of Education also expressed their concern with the reduction move. They said this decision could create a new problem in the education sector, if expat teachers are pushed to seek employment in other countries. They also pointed out the current practices already violated teacher's contracts. According to existing contracts, expat teachers should be granted housing. The ministry has substituted the direct provision of housing with monthly benefits, which do not come close to teacher's actual rents. Migrant-Rights.org spoke to a number of female expat teachers, who asked to remain anonymous. They were initially thrilled to learn of the court ruling, only to be soon disappointed by the minister’s divisive statement. Ten of the teachers thought it would be best to file a joint court case, in line with the ministry’s advice. However, their plans quickly became too risky, as they were threatened with losing their jobs, no matter the outcome of the court order. In a previous case against the Ministry of Education, a group of Egyptian teachers sued for unpaid benefits and won. The Ministry paid them according to the court ruling, and within 15 days their contracts were terminated. The teachers, along with their families, were then deported. Only one teacher from the group was not terminated because he made the effort to “waive his right” and withdraw his case, in order to avoid retaliation. Such cases are well-known among expat workers, and serve as weighty intimidation against pursuing owed dues.